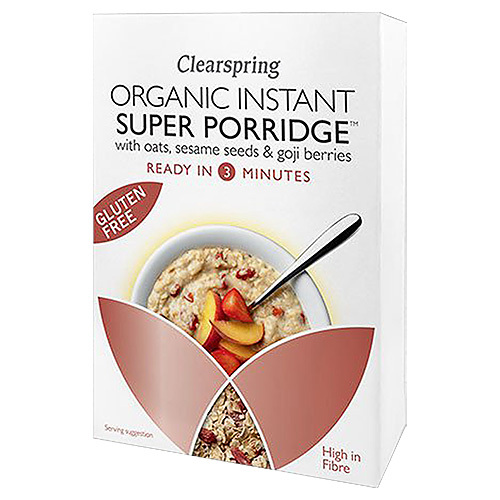 Clearspring Organic Instant Super Porridge is made with naturally gluten free oat flakes, roasted sesame seeds and a generous portion of goji berries. Specially blended for its flavour and nutritional characteristics, this creamy, naturally sweet and warming porridge is the perfect way to start your day. Delicious on its own or topped with malt syrup, fruit puree or seasonal fresh fruit. Gluten free oat flakes* (80%), roasted sesame seeds* (10%), goji berries* (10%). For one serving, mix 40g of Super Porridge with 150ml of soya or rice milk. Bring to the boil and cook for 3 minutes, stirring occasionally. Alternatively use almond or coconut milk for a more creamy, slightly nutty flavour. This box contains 4 servings. Reseal pack after use and store in a cool, dry place. 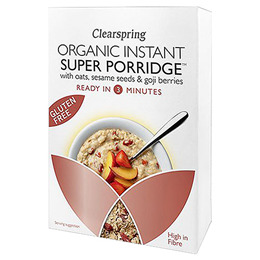 Below are reviews of Clearspring Organic Instant Super Porridge - 160g by bodykind customers. If you have tried this product we'd love to hear what you think so please leave a review.